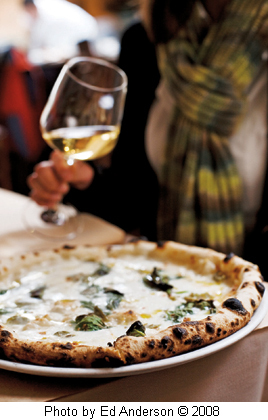 A16 in San Francisco, specializes in southern Italian cooking, Campania and Puglia.. See Review A16. More than the toppings, a good pizza demands a light, sturdy, flavorful crust. While pizzas bake quickly, an experienced pizzaiolo will transform a round of raw dough into a blistered pie in less than three minutes. Making the dough is a slow process. After eating pizzas at several pizzerias in Naples, I noticed that the crust at Da Michele had the deepest flavor. A handful of visits later, I figured out why: a bit of older, fermented dough is added to each fresh batch, giving the crust more complexity and a slight tang. A similar effect can be achieved by allowing for a long fermentation time. This not only gives the crust that tang but also provides an added benefit: as the dough ferments, it also becomes stronger and easier to work with. With this in mind, we use a small amount of yeast relative to the flour and let the dough develop flavor gradually as it ferments and proofs for two to three days. Yet dough is unpredictable. Heat and humidity affect fermentation times; so do salt and yeast. That's when practice is important. Some people have a natural feel for the dough, but with enough practice, anyone can learn how to make a decent crust. If you are not used to handling pizza dough, make one with a little less water (say, a cup) and a little more olive oil. Drier dough with more fat is easier to handle and manage. If you prefer to make the dough from start to finish in a few hours, add double the amount of yeast to speed up the rising time. Try several batches until you become comfortable, and hold off inviting friends over for a pizza night until you have the technique and rhythm down. One of the pizzas that follows calls for fresh mozzarella. Because the cheese has a high water content, never top a pizza with more than 3 ounces. If more is used, the pizza will be soggy, a problem we encounter when we receive orders for pizzas with extra mozzarella. Also, not all fresh mozzarellas melt the same. If you find that your mozzarella browns too quickly and hardens before the crust has finished baking, experiment with adding the mozzarella halfway through the baking process. Ideally, the mozzarella will melt into the tomato sauce, staying creamy rather than becoming chewy. The key to great pizza is the crust! Carmelo Guzzo, Pizzaiolo at Il Ripiglio in Salerno, emphasizes that both the dough and the oven temperature are very important. For the dough, use the best ingredients and do not overwork the dough with automatic mixers. If the mixer is set too fast, the dough gets warm and the consistency will be very poor. When an oven is too hot, the pizza gets burned. This will not be a problem in a home oven. When the oven is not hot enough, water will not vaporize and the pizza doesn't get soft. Oven temperature in a home oven should be about 500 degrees and always use a stone. Lastly, do not overload your pizza with ingredients. If you use mozzarella, use very little. The dryer, the better. For good flour, see either King Arthur Italian-Style Flour or King Arthur Sir Lancelot Hi-Gluten Flour. Another possibility is Caputo 00 Antimo Pizza Flour. To make the dough, in a small bowl, sprinkle the yeast over the warm water and let proof for 10 minutes. If the yeast has not dissolved into a soft, frothy paste in that time, hunt down a fresher batch and repeat the process. Stir in the olive oil and salt. In the bowl of a stand mixer fitted with the dough hook, combine the flour and yeast mixture and mix together on low speed for about 2 minutes, or until the dough is shaggy and most of the water has been absorbed. Knead on medium-low speed for about 10 minutes, or until the dough pulls away from the sides of the bowl and looks smoother. Cover the bowl with a damp kitchen towel and let rest for 5 minutes. Knead on medium-low speed for an additional 10 minutes, or until the dough is very smooth, soft, and warm to the touch. Lightly coat a large bowl with olive oil. Transfer the dough to the bowl, turn the dough so that both sides are lightly coated in oil, cover with plastic wrap, and refrigerate overnight. The next day, punch down the dough with your fist, then fold over the sides and turn the dough over in the bowl. Re-cover and return to the refrigerator for at least 4 hours or up to 24 hours. Remove the dough from the refrigerator and place it on a floured work surface. Divide the dough into 4 equal pieces. One at a time, cup the pieces in your hands and tuck under the sides until you have formed a smooth ball. Place the balls on the floured work surface, providing plenty of room between the balls, and cover with a damp kitchen towel. Let the balls proof for 1 1/2 to 2 hours, or until doubled in volume. Keep a water-filled spray bottle handy, and if you see a skin forming on the surface of the dough, spray the surface to dissolve the skin. The skin will prevent the dough from rising properly and will make shaping the dough difficult. To make your oven pizza ready, place a pizza stone on the lowest rack and preheat the oven to its maximum temperature (typically between 500˚ and 550˚F) for at least 30 minutes. To shape a ball of dough into a pizza base, place it on a well-floured work surface. Using the tips of your fingers, pat down the ball, flattening it into a disk. Place the palm of one hand in the center of the dough and gently but firmly press down. At the same time, with the other hand, pull the dough outward while rotating it clockwise to form a flat circle with a slightly raised edge, or cornicione. If the dough feels resistant as you stretch it, set it aside, covered with a damp kitchen towel, while you work on a second ball of dough. This will give the gluten a chance to rest, making the dough more pliable once you return to it. The entire time you are working on the dough, maintain a thin layer of flour underneath it to prevent it from sticking. If you don't feel confident handling pizza dough, try starting with a rolling pin to ensure you begin with an even circle, and then return to hand stretching. Continue to stretch the dough, allowing time for it to relax as needed, until it is 10 to 12 inches in diameter. Generously dust a pizza peel or a rimless baking sheet with flour. Slide the pizza base onto the peel, and then immediately shake the peel to ensure the dough isn't sticking to it. Dress the base with the selected toppings. To transfer the pizza to the pizza stone, place the peel over the stone and quickly jerk it back. The pizza should slide smoothly off the peel onto the stone in one piece. It is important to bake the pizza immediately after putting the toppings on it, or the dough will soften and stick to the peel. If you are grilling the pizza, follow the instructions below, making sure not to add any of the toppings until the base has been brushed with olive oil, grilled on the first side, and flipped over. Bake the pizza for 6 to 7 minutes, or until the dough is crisp and golden brown and the top is bubbling. Take care not to open the oven door often to maintain the high oven temperature. Using the peel or baking sheet, remove the pizza from the oven, drizzle with olive oil, and cut into 4 pieces with a knife or pizza cutter. Serve at once. Repeat with the remaining 3 balls. This is a great reminder that not every pizza needs tomato sauce. 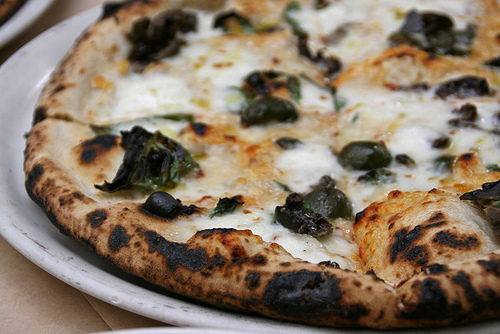 Briny green olives and dried chile flakes cut through the richness of the cheese. Evenly scatter the grana over the surface of the pizza base, followed by the basil leaves, olives, and chile flakes. With a sharp paring knife or a mandoline, slice the garlic into paper-thin slices and distribute them evenly over the pizza. Judiciously distribute the mozzarella over the top. Reprinted with permission from A16: Food + Wine by Nate Appleman and Shelley Lindgren, copyright 2008. Published by Ten Speed Press. Reprinted with permission from A16: Food + Wine by Nate Appleman and Shelley Lindgren, copyright © 2008. Published by Ten Speed Press. Perfect for the height of summer when you have too many tomatoes on your counter, this pizza is the most delicate one we make. The recipe calls for a beefsteak tomato, but the pizza is also terrific with a handful of halved cherry tomatoes. Core the tomato, cut into 1/4-inch chunks, and place in a small bowl. Sprinkle with salt to taste, toss gently, and set aside at room temperature for at least 30 minutes or up to 2 hours. Place the ricotta in a separate small bowl, add 1/2 teaspoon salt, or to taste, and mix well. Evenly scatter the grana over the surface of the pizza base. With a sharp paring knife or a mandoline, slice the garlic into paper-thin slices and distribute them evenly over the pizza. Sprinkle with the chile flakes and basil leaves, and judiciously distribute the tomato and ricotta over the top. Bake as directed. At San Francisco's acclaimed A16 restaurant (named for the highway that cuts across southern Italy), diners pack the house for chef Nate Appleman's house-cured salumi, textbook Naples-style pizzas, and gutsy slow-cooked meat dishes. Wine director Shelley Lindgren is renowned in the business for her expeditionary commitment to handcrafted southern Italian wines. In A16: FOOD + WINE, Appleman and Lindgren share the source of their inspiration--the bold flavors of Campania. From chile-spiked seafood stews and savory roasts to delicate antipasti and vegetable sides, the recipes are beguilingly rustic and approachable. Lindgren's vivid profiles of the key grapes and producers of southern Italy provide vital context for appreciating and pairing the wines. Stunning photography captures the wood-fired ambiance of the restaurant and the Campania countryside it celebrates.